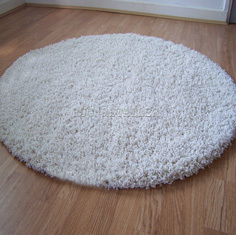 Jazz shaggy round rugs are a plain shag pile rug woven in 10 modern colour-ways. This range is machine woven in Turkey, the pile is made from 100% polypropylene, the pile height is 50mm and the total weight is 2550g/m2. Jazz rugs are suitable for surface shampooing, ideal for living rooms, children's bedrooms and heavy use areas. Made in five popular sizes including a runner and a round size.